As a cellular and developmental biology major, I was fascinated by the diversity of life on this planet Earth. My fascination began in childhood as I roamed the fields and played in the creeks on our farm in Michigan. I loved to collect leaves and bugs, climb trees, watch ants, catch frogs and study flowers. I spent hours outdoors, communing with nature and it was always a spiritual experience for me. I am in awe of the variety of shapes and colors; species and phyla found in the plant and animal kingdoms. And beyond that, the fierce determination to survive and the ability to adapt are impressive. Take the majestic sequoias in Yosemite and their cousins the coastal redwoods in Muir Woods National Monument, where these ancient trees are protected. It was a privilege to visit these special places. 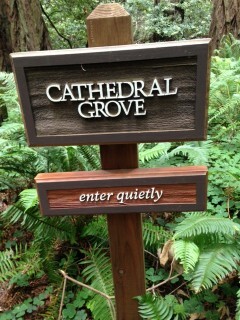 Even with my diminished vision, I was able to sense the grandeur as I entered Mariposa Grove and Cathedral Grove. I walked among trees that were as old as 2000 years, as tall as 379 feet, and as wide as 40 feet. Talk about behemoths! I felt very small and inconsequential; my life but a momentary breath in comparison. The forest’s gauzy shafts of light, swirls of purple shadows, melodious songs of birds, earthy herbal fragrances, and gurgling sounds of streams all intermingled to create an ethereal effect. Indeed, this is a natural cathedral, serene and solemn, commanding a hushed respect. These redwoods have stood for eons of time, against the forces of natural disasters, man and change. Sadly, they are the lone survivors of their species, now protected from the chaos and clamor of the outside world. I gratefully received the gifts of peace and tranquility they offered. And I came away with a few lessons from these wise old trees. Stand Tall and Proud– redwoods are the tallest living thing on earth. They have survived fires, droughts and other hardships. They bear scars and cracks which testify to their struggle to live. Wear your scars of survivorship proudly and stand with dignity. 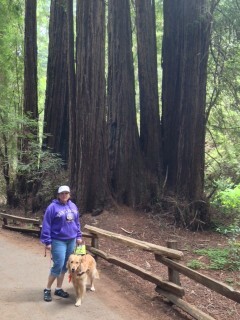 Live in a “Cool” Place-redwoods grow best in the cool temperatures of the fog belt in California. They flourish in this moist environment. Find your special place in the world where you can thrive. Support Your Community-redwoods have a disproportionately shallow root system for their size. Their roots extend widely to tangle with other near-by trees in order to anchor themselves securely. Reach out to your community to establish connections with others. Grow a Thick Skin-redwoods have very thick, spongy and fibrous bark, rich in tannic acid which makes it resistant to fire, insects, and fungi. Allow your skin to thicken so you can resist the assaults of life. Surround Yourself with Family-redwoods have the ability to reproduce by sprouting burls and forming tightly grouped “family circles,” giving them a survival advantage. Stay close to family so they can fortify and strengthen you. I am always looking for what nature can teach me. We live in such an exquisitely designed and spectacularly intelligent world. When we stop to observe and listen, we learn great secrets and truths. These sacred experiences teach us to respect and appreciate the beauty and gifts of the Earth. The clearest way into the Universe is through a forest wilderness. In every walk with nature one receives far more than he seeks. 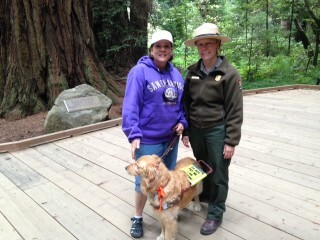 Taking the myths out of blindness, the mystery out of dog guides, and the magic out of Braille.